It's February, 2016, and DC Comics will move through the room like ambulance drivers. Shine Szymon Kudranski's shoes with your microphone blues. Hirsutes, with your parachute flutes, passing the dutchie from coast to coast. Let the man Benjamin Percy rock the most. TO QUOTE Robert Hatch, Bill Bridges, and Mark Rein-Hagen: “The acrid air is heavy with hate and a question hangs in the haze -- when will you rage?”. All right, all right, all right. I realize that my little intro to this review makes absolutely no sense, and even if you recognized the song lyrics, the actual issue credits are so awkwardly crammed in there that at best it made you wince or roll your eyes. 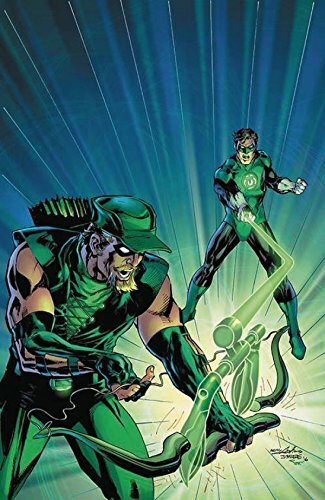 Any sane person would have gone back and come up with something better, but the average Green Arrow fan enthusiasm for Ollie's gradually increased hairiness is going to trump that sense. And once you start saying, “oh my, it's Neal Adams alternate cover month, and post-Flashpoint Oliver is looking more hirsute than ever,” then you get a Beck song stuck in your head, and Bob's your uncle, you've gone and done that. So, yeah! Give a guy a little werewolf infection and watch him let his beard and hair grow out. Moving on. If you still haven't read the Annual that came out in October, I've got no more pity for you. 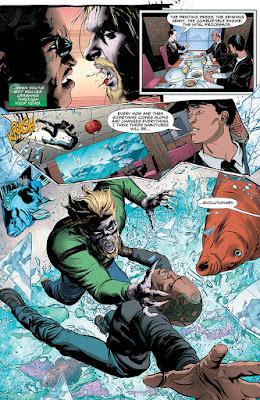 Stephanie Brown alert: Ollie's a werewolf, with red eyes, fangs, claws, and has an insatiable lust to beat up gangsters. But it's a medical infection with some shady government faux-quarantine ghettoizing practices that's really hitting the fan. For instance, there's those effected who want fair treatment, a criminal element within the effected, and, obviously, the extremist militias who want to treat all the effected as part of said criminal element. 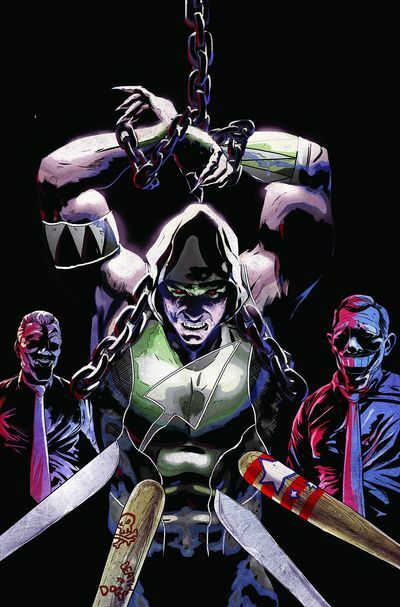 Overall this issue wobbles back and forth between how Oliver is coping with this infection / power, and picking up the threads of the Patriots gang and Berserkers Bike Club's individual assaults on Seattle back on Halloween night. We don't know if the Lukos has accelerated Oliver's hair growing pace, but we know at least some time has passed since his time up in the mountains last issue. Enough time for the court proceedings against Dolph Marrock and the Patriots to conclude, which is where our issue opens. This is one of those issues where I felt like it was all a set-up (But really, what comic isn't just a set-up for the next one?). Yet upon closer reexamination there was really a lot going on. There's the action scene, there's the heroic rescue, there's the villainous plotting, there's the villainous machinations, and there's the hero's quiet moment and call to action. What was missing to me was that I felt like there wasn't a big climactic moment. Lacking a big reveal on the last page, I think the big cliffhanger was supposed to be the reality behind the Patriots' plot, but it was telegraphed so early it didn't read that way. On Ollie's side, his big realization about finally seeing the world from “a disadvantaged point of view” was really made last issue, so his character development in this issue felt very redundant. It was exaggerated, so instead of him seeing what he could become he instead experienced it firsthand, but I suppose the big to-do was actually admitting it out loud to Emiko rather than just in his own mind. Good thing this is a pretty one, eh? Lots of cool action, and the return of Kudranski to the Warg arc works very well. It's kind of a magnificent look for the dark streets of Seattle. Or, as the case may be, the dark, uh, fields, of Walla Walla. His habit of decorating any outdoor scene with airborne artifacts (such as leaves in the woods, stray scraps of paper in city streets, or glass and fish and soup as the case may be) is a beautiful technique that I've really taken a liking to. Coupled with his attention to the design of individual frames in the layout -- stylizing them as yearbook photos, or prison bars, or barbed wire, and so on -- this really helps to escalate his art from typical superhero fare to an art book. Percy could start churning out bam-pow-biff stories and I think I'd be okay with it if Kudranski's still drawing it. I just wish he could make Emiko look a little less like a porcelain China doll. This look is a little disconcerting. On the flip side, even though Broderick didn't say anything particularly douchy in his brief appearance this issue, he sure as hell still looked pretty damn douchy. So I'm sure we've still got him on tap -- and probably the Jeon-Wi carbon nanotubes -- for a future story arc. Chief Westberg also pops up again this issue, which is a nice treat for us continuity nerds, whether he continues to develop in to a full Jim Gordon or Maggie Sawyer tier character or just stays a constant background character. Of course, what review by a continuity nerd would be complete without speculating as to whether Kraken is the local boss representing the same organization that Gwisin represents in The Syndicate? The way this issue reads, Kraken feels more like a disposable plot device, but with Benjamin Percy's habit for planting seeds in one story for a future story, I put nothing past him. Now I know Korea's a big place and there's likely more than one criminal organization known beyond its borders. At a minimum, I'm hoping Kraken wants some revenge on 'that hairy guy' who interrupted his bathroom break. Speaking of that restaurant scene, maybe it's just my dirty mind, but I think I need to give Gabe Eltaeb some crap about that first overhead frame. The lady with the green hair walking back to her table seems to … um … have had a wardrobe malfunction. Or just likes to let the girls out when she dines? And then Broderick appears to start the “visionary” speech that the Jeon-Wi rep finishes. Which is… weird. Right? I'm going to get really dark in the conclusion, so rather than drop another Varg song on you (with a music video of women slaughtering some “real wolves” in the woods), we'll keep the musical references lighthearted. And to me, it doesn't get more lighthearted than The Baha Men's 'Who Let the Dogs Out? ', now does it? But you may ask why we're singing about dogs and not wolves. When you read, you shall understand. It's not very deep, my friend. This issue brings us a couple of different bad plans. There's Ollie's plan: that may or may not backfire on him from a secret identity perspective and would probably be far worse had Emiko not interfered. And then there's the Patriots' plan: which we're all expecting to backfire in a fairly splendid fashion, right? 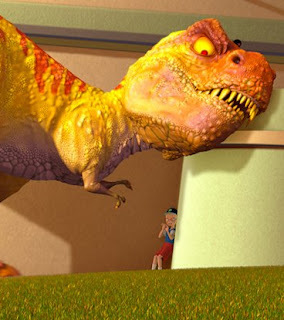 Everyone's favorite bad idea is, of course, from Meet the Robinsons, when Goob mind controls the T-Rex Tiny in to trying to capture Lewis, a plan quickly foiled by Tiny's big head and little arms. When all is said and done, this issue has done a really good job. OK, so maybe it was lacking a climax, but what it pulled off really well is to paint a horror story that is both realistic and fantastic all at the same time. On one hand we've got the literal monsters, the Wargs, running around ripping people apart. Whereas on the other hand we've got the monsters that are “hairy on the inside” -- an all too familiar fanatic group organizing against the Wargs, with thinly veiled real-world financiers that only crosses the bridge in to fiction when their action items list escalates all the way to bombings and assassinations. At least, I'd like to tell myself that such large scale corporate-funded terrorism is a work of fiction. Great. Now this comic has me really depressed about the state of the world. Good thing it's also got Emiko dropping Oliver Sacks references on her brother. So I tell you what. Let's close on a more positive note, then, eh? It's a little spoilerish, in that it happens on the last page and is the closest thing this issue really has to an unexpected climax, so pull the eject cord now if you want to avoid it. I could be mistaken, but I'm fairly certain that this is the first time that Oliver has proactively asked / told Emiko to suit up with him. Taking this as a turning point for Oliver as a character, and not just a change in the status quo, it's a huge moment, and packs far more punch than his (second) realization that he's disadvantaged. I know I expressed concern back in the panopticon arc with Emi going with the red motif being a bit too big a reach to draw Arsenal / Speedy parallels. But now that there's a Big Bad Wolf to fight, I'll admit that I really wouldn't be adverse to her playing Little Red Riding Hood for a couple of issues. Especially if she chops the Patriots open. 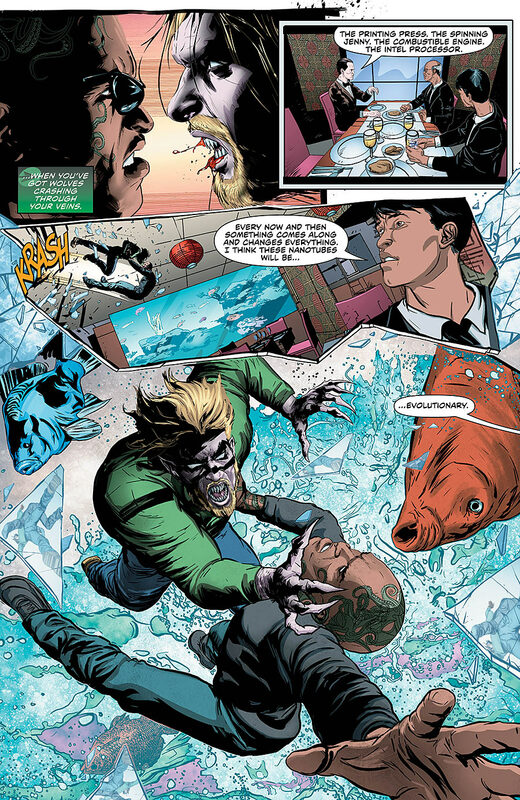 Also, if Szymon Kudranski could please publicly release the page showing Emiko dragging an unconscious Oliver through the streets of Seattle as a crowd gathers in response to the ruckus and first responders start to arrive, that'd be great. I'm assuming they were cut due to issue length, right?